Welcome to a fascinating journey aboard the Deccan Odyssey, an 8 day ride through the hinterlands of Maharashtra, the majestic Western Ghats, into the Deccan and Konkan regions of a vast and diverse continent. This itinerary includes visits to some of the most prominent & unexplored destinations of west-central India, with a trip to the holy city of Nashik, now also India’s wine capital; to the unrivaled Ajanta & Ellora Caves; the historical city of Kolhapur with its many experiences , to Goa, India’s most popular holiday destination; finishing with a visit to the holy city of Sindhudurg. 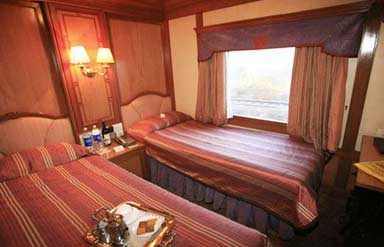 A railroad journey like none other, in a land like no other, we welcome you on board the Deccan Odyssey. Early this evening assemble at the Chhatrapati Shivaji Terminus at approximately 1530 hours to complete the registration process and check in formalities for your Maharashtra Splendor journey, as you receive a traditional Indian welcome and enjoy a refreshing welcome drink. After completion of all formalities, you will be shown to your delightful cabins. 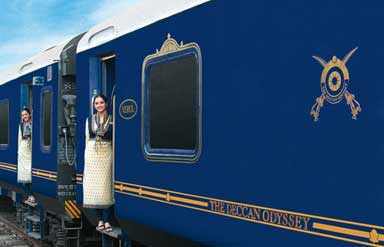 As you settle in, the Deccan Odyssey shall depart Mumbai for? Nashik. After breakfast, disembark and spend the morning walking along the Godavari Ghats observing several important Hindu rituals being performed. Continue on through the lively market by the Ghats which sells everything from vegetables to lentils, dried seafood to cow dung cakes and many things in between. Thereafter drive to the Grover Zampa vineyards for an exclusive tour of one of the finest Indian wine producing facilities. Walk through vines laden with Chenin, Chardonnay and? Shiraz grapes. Be taken through the age old ‘m?thode traditionnelle’ used to make one of the best known brands of sparkling wines in India. Allow the sommelier to acquaint your taste buds with their finest creations of white, red, rose and sparkling wines and experiment pairing them with your meal at the vineyards. As you enjoy breakfast, the Deccan Odyssey arrives at Aurangabad, from where a scenic drive takes you to the Ellora Caves, carved into the side of a basaltic hill 30 km from the city. The finest specimen of cave-temple architecture in India, the site encompasses 34 rock-cut shrines representing Buddhist, Jain and Hindu art dating from the 4th to 5th century AD. The 12 caves to the south are Buddhist, the 17 in the centre Hindu, and the 5 caves to the north are Jain. The most remarkable is the Kailash temple, meant to be a replica of Shiva’s celestial abode on Mt. Kailash. It is the best example of rock cut architecture and an engineering marvel. Savour a leisurely lunch on board as the hinterland of Maharashtra sweeps past, with its ever-changing colors and landscape. The Deccan Odyssey arrives at Jalgaon station this morning from where, after breakfast on board, you will disembark and drive to the Ajanta Caves, another World Heritage site and an architectural marvel of its time. The 30 rock-hewn Buddhist caves at Ajanta have been masterfully carved and are adorned with sculptures and paintings of Buddhist religious art, depicting universal pictorial art and are known to depict the fusion between Buddhist and Hindu faith. Lunch will be on board the Deccan Odyssey as it continues on to the multifaceted city of Kolhapur. The rest of the day is at leisure for you to relax and enjoy some of the activities available on board. Watch amovie, learn the rules of ‘carrom’, a popular Indian board game, from a Deccan Odyssey team member or book yourself a relaxing massage in our spa on board. Watch the hinterlands of Maharashtra sweep past as you relish breakfast. Enjoy time at leisure as the Deccan Odyssey rolls into Kolhapur, a city of many hidden treasures, all waiting to be discovered! After an early lunch on board you will disembark for a tour of the city. Visit the New Palace Museum, a lovely basalt and sandstone octagonal Palace from the 19th century. Behold its beautiful architecture and memorabilia of the Kolhapur rulers. Continue to the Town Hall Museum, a somber neo-Gothic building, its front porch flanked by towers with steeply pyramidal metal roofs. Explore the local markets for a pair of beautifully handcrafted Kolhapuri chappals that you can carry back with you as a souvenir, before you proceed to a special venue for tea followed by Lavanya Sandhya, a vibrant folk performance. You will then visit the 1300 year old Mahalakshmi temple, also called Shakti Pethas, or place associated with the Goddess Shakti, said to be the consort of Lord Vishnu. Following your temple visit, witness a traditional martial arts performance called ‘Mardani Khel’ literally translated to mean masculine games. Today you arrive at Goa, India's smallest state, with strong Portuguese influences, having been a colony of Portugal till as late as 1961. After breakfast, you will disembark and drive to Fontainhas, the Latin Quarters in Panjim which still has some well preserved houses built in Portuguese style architecture. Experience the UNESCO World Heritage Walk around Fontainhas with its winding alleyways adorned by tiled-roofed houses in spectacular shades of blue and red.? Continue to Ribandar, the erstwhile capital of Goa, for a walk through ancient churches and the ruins of the once lofty St. Augustine tower that continues to valiantly withstand the vagaries of nature. Drive to the Sahakari spice plantation for a traditional Goan feast, a meal that has Hindu origins but is heavily influenced by 400 years of Portuguese rule and pays ode to the fruits of the Arabian sea - shrimps, kingfish and mackerel washed down with some ‘feni’, a potent liquor made from cashew. After lunch, enjoy a Goan folk performance and a tour of the plantation. Complete your day in Goa with a visit to an old Portuguese house and get another peek into Goan life. Return to the Deccan Odyssey for dinner as it departs for Sindhudurg traversing through the Konkan, one of the most scenic railway routes in the country, bound by the Arabian Sea on the West and Sahyadri hills on the East, a marvelous feat of engineering, that made it possible to tunnel the tracks through the seemingly insurmountable hills. Arrive in Sindhudurg which lies on a rocky island just off the coast of Malvan. A visit to Sindhudurg’s Pinguli village and Sawantwadi Palace is on the cards today. Get a glimpse of the traditional Thakar folk arts and crafts at the local museum, then head towards the Sawantwadi Palace for a delicious luncheon. Breakfast & Dinner on board, Lunch at a city palace.